This cauliflower recipe may just steal the spotlight at the dinner table. 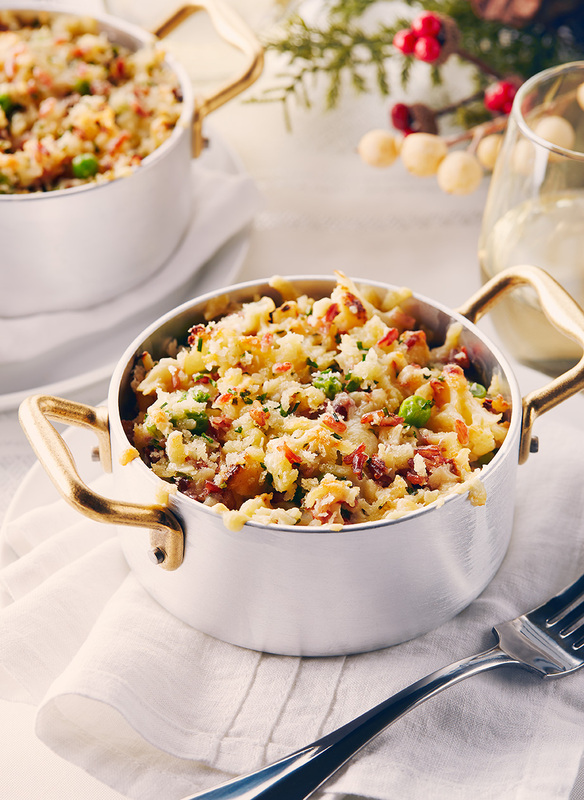 This savoury gratin combines cauliflower florets, red rice, and melted cheddar cheese with a medley of flavours and textures that will dance on your palate. Whether enjoyed on its own or paired with chicken, beef or fish, family and guests will be singing your praises with this tummy warming dish. Chop cauliflower into bite sized florets. Toss with olive oil and coat evenly. Arrange on 2 baking sheets in a single layer. Roast on centre and lower third racks at 425°F (220°C) for 25 to 35 minutes until golden brown. Meanwhile, sauté onion and thyme in butter for 2 minutes over medium high heat. Stir in Dijon, hot sauce, pepper, salt and flour. Slowly pour in broth and milk stirring constantly. Bring to a simmer and stir in 1/2 cup (125 mL) cheddar. Remove from heat, pour sauce into a large heatproof bowl, add roasted cauliflower, peas, and rice. Toss to coat and transfer to a 9X13 inch (3 L) baking dish. In a small bowl, combine 1/2 cup (125 mL) cheddar, panko and chives. Sprinkle evenly over cauliflower rice mixture. Bake at 400°F (200°C) for 25 to 30 minutes until bubbly and top is golden brown. Tip: can substitute with U.S. brown or black rice. PER SERVING (1/6 recipe): 361 calories, 17 g fat, 9 g saturated fat, 42 mg cholesterol, 528 mg sodium, 41 g carbohydrates, 5 g fibre, 14 g protein. % RDI: 25% calcium, 10% iron, 20% vitamin A, 120% vitamin C.
SOURCE: USA Rice Federation, http://www.riceinfo.com. Easy no-cook appetizers for the holidays! We’re working our way through all downtown #TO vegan restaurants. Today @awaykitchencafe we just loved the Pan seared artichoke hearts with Dorée garlic, olive oil, white wine, sundried grape tomatoes, béchamel sauce, almond parmesan, and house made bread 🍞!! . . . .
Two words: baked Brie! 👅😍 with red pepper jelly and pesto. . . #torontofoodie #foodjournal #foodheaven #foodielife #eeeats #thefeedfeed #eatingfortheinsta #igfoodie #eattheworld #infatuation #foodiesofinstagram #topcitybites #foodiechats #tofoodies #torontoblogger #foodholics #hunger #instablog #foodphoto #yummy #foodpics #foodforfoodies #local #foodforthought #foodisfuel . . . .
Great posts you may have missed. Hurry!